Guys, I've done it. This chutney is the business. As in, I'm going to start a business and sell this chutney. 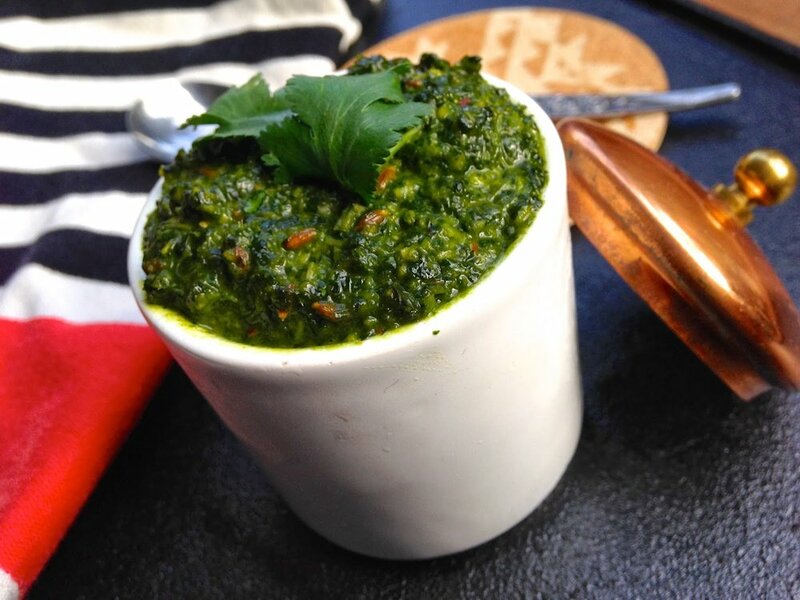 This classic mint and coriander condiment is typically served with samosas and other chaat (snacks), but it's also fantastic as a marinade or sauce for any meat. Cilantro = coriander, by the way. 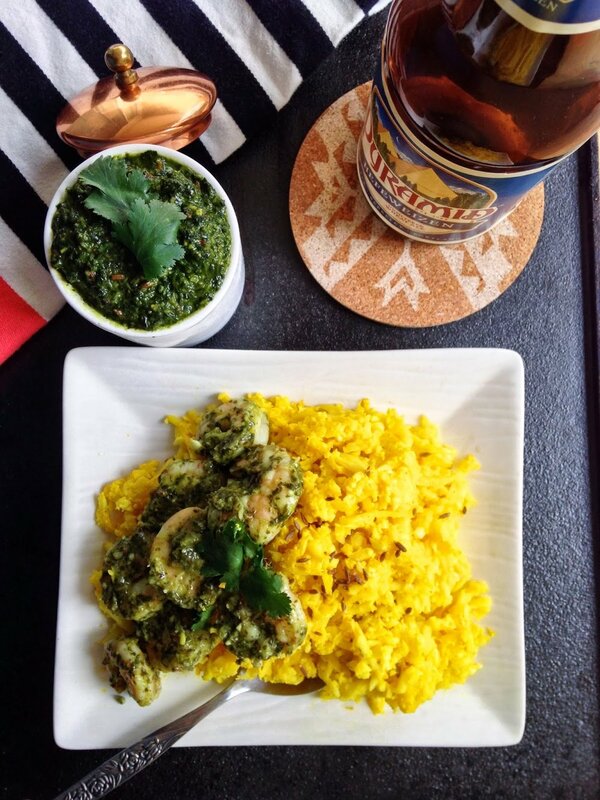 We call it "cilantro" in las Americas, but it's "coriander" in India and other places on the planet. 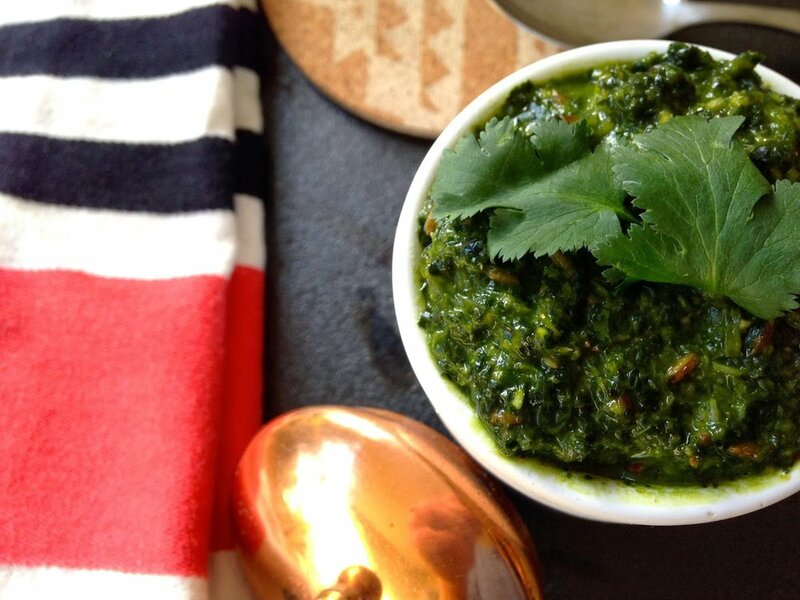 To make it more confusing, we call cilantro seeds "coriander" in the U.S.I love my Indian food (exhibit A, B, C...) and hari chutney is one of the best pieces of the puzzle. You can pretty much use it interchangeably with pesto or chimichurri. Or you can throw it in with some mayo and make a rad aioli. This go-around, I tossed it in with some sautéed shrimp and curry-lemon cauliflower rice (I'll share that recipe in another post someday!). crushed red pepper to taste (how spicy do you like it?) **I substituted this for heat instead of the traditional green chilies because I didn't have any on hand, but you can use either one! Optional: drizzle of 2-4 tablespoons of olive oil **This will make it more of an emulsion/pesto, which was great for my purposes with the shrimp. Throw all of these ingredients in a food processor and blend until you reach your desired consistency. If you're adding olive oil, blend that in at the end. Taste and adjust salt, pepper and spice accordingly. It'll keep for a couple of days in the fridge. Dry the shrimp well with paper towels. Heat ghee in a large sauté pan on medium-high. Toss the shrimp in the arrowroot powder, salt and pepper. Sauté the shrimp until cooked (a couple of minutes on each side—it depends on the size of your seafood). Toss the hot shrimp in the mint-coriander chutney (I only used about half of the chutney and saved the rest to eat with a spoon). It's so flavorful that a little goes a long way with this stuff. You could also marinate the shrimp (or whatever meat/veggies you like) for a few hours in the chutney before cooking instead of tossing it in after. Eat it with keema like a deconstructed samosa. Serve as a condiment with eggs, roasted veggies, potatoes or basically any kind of food in the world. Buy this chutney from me in a jar on a a regular basis. I am now accepting orders and I am 100% serious. Do you have any condiments that you can't live without? Spill.